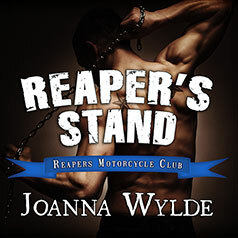 In the fourth installment of Joanna Wylde's Reaper's MC series, president Reese "Picnic" Hayes gets more than he bargained for in London Armstrong, the club's new cleaning lady. Contains mature themes. As Reapers Motorcycle Club president, Reese "Picnic" Hayes has given his entire life to the club. After losing his wife, he knew he'd never love another woman. These days, Reese keeps his relationships free and easy—he definitely doesn't want to waste his time on a glorified cleaning lady like London Armstrong. Too bad he's completely obsessed with her. Besides running her own business, London has her junkie cousin's daughter to look after. Sure she's attracted to the Reapers' president, but she's not stupid. When her young cousin gets caught up with a ruthless drug cartel, Reese might be the only man who can help her. Now London has to make the hardest decision of her life—how far will she go to save her family?